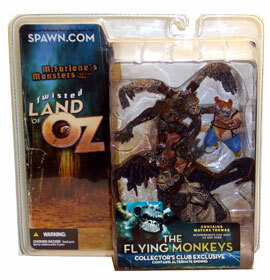 Description Of Item: THE FLYING MONKEYS Exclusive Figure Twisted Land Of Oz McFarlane Monsters Series 2 Collector's Club Exclusive. Contains Alternate Ending. McFarlane Toys second Monsters series is based on the L. Frank Baum novel The Wonderful Wizard of Oz. The classic characters in the book receive a bit of a twist in this series, an artistic interpretation of what could have been in an alternate Wizard of Oz universe.